Carl Perkins, "the king of rockabilly." Jerry Lee Lewis, "rock and roll's first great wild man." Johnny Cash, "one of the best-selling musicians of all time." Elvis Presley, simply "the king." In 1956, these four men were in their 20s and at the early stages of their influential and prolific careers. 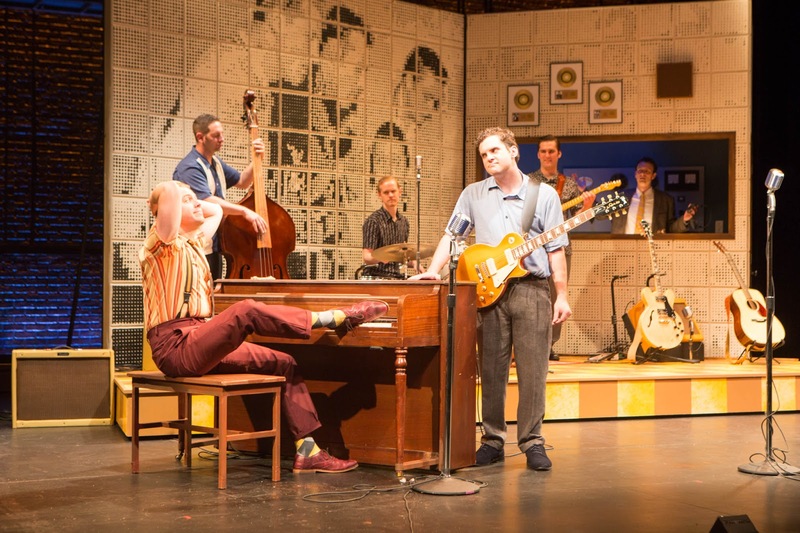 They came together for one night at Sun Records in Memphis for a jam session, which was recorded and released as the Million Dollar Quartet. So of course, this story had to be made into a musical. 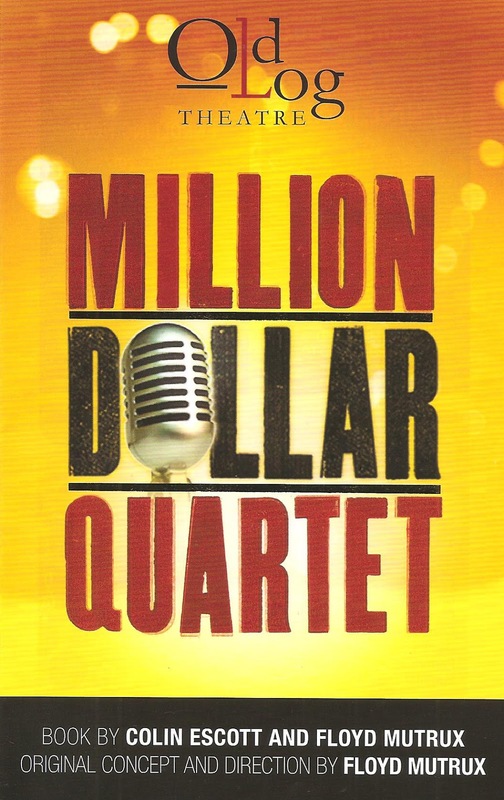 Colin Escott and Floyd Mutrux did just that; the musical Million Dollar Quartet opened on Broadway in 2010. It only ran for a year, but found success on tour and regionally, as such crowd-pleasing jukebox musicals do. Despite a fairly thin book, it's a great show, precisely because we all know and love these songs and these singers. Even if we weren't alive in 1956, these four artists and their music are an integral part of our musical heritage. The Old Log Theatre recently opened a long run of the show with a fantastic cast that's definitely worth the drive out to charming lake town of Excelsior in the Western Metro. 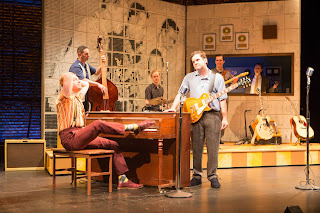 The story, such as it is, plays out on one night in December of 1956 at Sun Records in Memphis. Sun owner and music producer Sam Phillips narrates the evening, with flashbacks about how each artist came to be at Sun. Soon after selling Elvis' contract to RCA to save Sun, Sam has been offered a position at RCA, and has to decide between working for the big machine, or continuing to struggle to run his small business the way he wants. That's pretty much the extent of the plot, but no one comes to see this show for the plot. We do get a sense of who each artist is and where they are at this point in time. as Jerry Lee Lewis. I've always found Eric to have great energy on stage, but never put to better use than as Jerry Lee, the only member of the quartet still living and a man so charismatic, he convinced seven women to marry him (including his 13-year-old cousin, but that was after the events of this night so let's not dwell on it). Pounding on the keyboard with his hands, feet, and other body parts, kicking the bench out of the way, performing some impressive hairography, and even climbing on top of the piano, Eric's performance is the fire that fuels this high energy show. Pro tip: keep your eyes on Eric throughout the show to see his always interesting and consistent character choices, even when quietly playing piano in the background. Which of course Jerry Lee Lewis never did, and Eric Morris doesn't either. On the other end of the spectrum, and the stage, Eric Sargent's Johnny Cash is like water - as in smooth, cool, and long tall drink of. The first time I saw Eric on stage his flowing brown locks reached past his shoulders and he beautifully sang one of the lead roles in Gilbert and Sullivan's operetta Iolanthe. I was afraid he and his voice were too pretty for one of country music's best loved and grittiest stars, but happily I was wrong. Gone are the flowing locks, replaced with a smart, slick, and slightly darker hairstyle, and his lovely operatic voice has transformed into that familiar bass-baritone voice (still a little too pretty to be Johnny, but I don't mind). If you'll allow me to continue this probably labored analogy, Matt Tatone is the earth element that grounds the show with his impressive guitar skills (he started playing at age 13, and it shows) and solid stage presence as Carl Perkins, the veteran of the group who's just trying (and succeeding) to continue to be heard amidst all the bright new stars. That leaves Frank Joseph Moran's Elvis as, appropriately, the wind that blows through the studio and stirs things up, making this monumental evening possible. Frank has the star power, mellow tone, pompadour, and trademark swiveling hips (choreography by Deb Knutson) of The King of Rock and Roll. 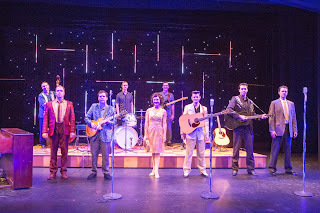 Of course, the guys are just four disconnected elements without the heart and soul of the show, Paul Rutledge as Sam Phillips, the man responsible for bringing these stars together, and to the world. His narration ties the stories together, and his dilemma about the future of the business provides the throughline of plot around which the songs are placed. 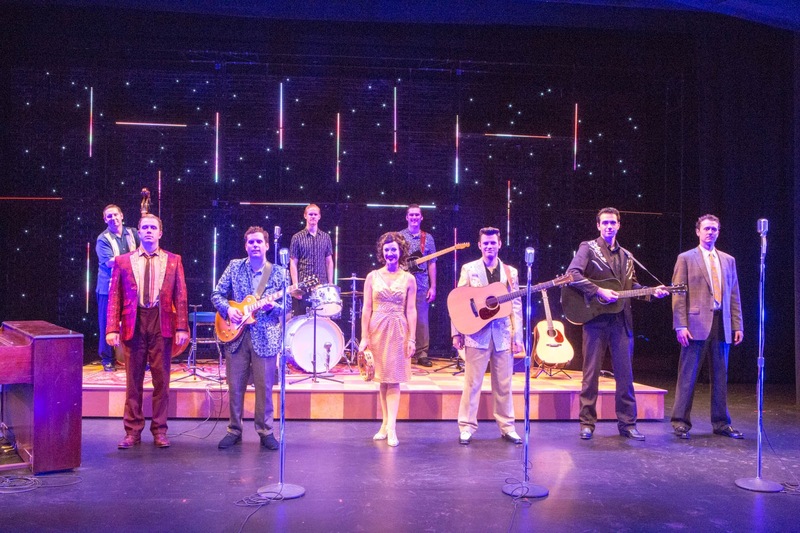 And just to prove that Rock and Roll wasn't 100% an old boys club (maybe 95%), Mollie Fischer appears as Elvis' girlfriend, dancing, flirting, wearing a pretty dress, singing a few songs (including a showstopping Fever), and holding her own amongst the boys. 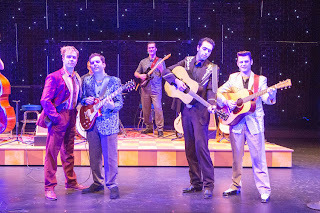 The cast really performs these familiar and beloved songs with spirit, heart, and soul, supported by the band that also functions as characters (Joshua Ackerley, Spencer Schoeneman, and Kyle Baker), with musical direction by Kyle Picha. You'll hear the big hits like Carl Perkins' "Blue Suede Shoes" (yes, he wrote it and sang it first), Johnny Cash's "I Walk The Line," Jerry Lee Lewis' "Great Balls of Fire," and Elvis' "Hound Dog." This loud, fast, classic '50s Rock and Roll is the kind of music you can't sit still while listening to, or at least I can't. But my favorite moments were the beautiful harmonies on songs like "Down By the Riverside" and "Peace in the Valley." 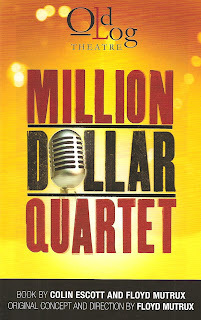 Million Dollar Quartet is about the music, and the music is fantastic. One small quibble with the show: the celebration of the misappropriation of black music by white artists feels a little insensitive and uncomfortable in today's environment. Sam actually says that because white kids are afraid to buy records by black artists, he needs to find a white artist who can sing like a black artist. Hence, Elvis. Wikipedia tells me that Sam Phillips "advocated racial equality and helped break down racial barriers in the music industry." It would have been nice if the creators had delved into that side a bit more, rather than a just a few throwaway lines. But I guess that's what the musical Memphis is for. I brought my parents to see the show, and my dad, the biggest Johnny Cash fan I know, loved it. That's perhaps the biggest measure of success of a show like this, if the people who grew up with these artists connect to it. But for longer success it also needs to appeal to those of us less familiar with the artists. And it did for me, thanks to the dynamic performances of the cast. 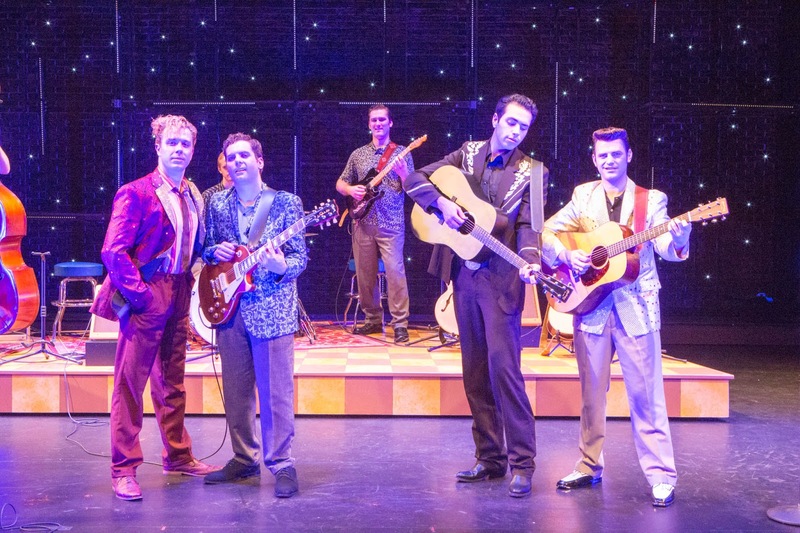 Million Dollar Quartet is playing at the Old Log through January 2017 so you have plenty of time to get out there and see it. But why wait? Why not go now when the charms of Excelsior are at their summer peak? Head over there in the early afternoon to avoid rush hour traffic, peruse the cute and unique shops, sit by the lake, eat at one of the many restaurants, and cap off the night with this nostalgic and musically thrilling show. And if you live in the area, be sure to check out their concert series, which includes the fabulous Jennifer Grimm on August 17.